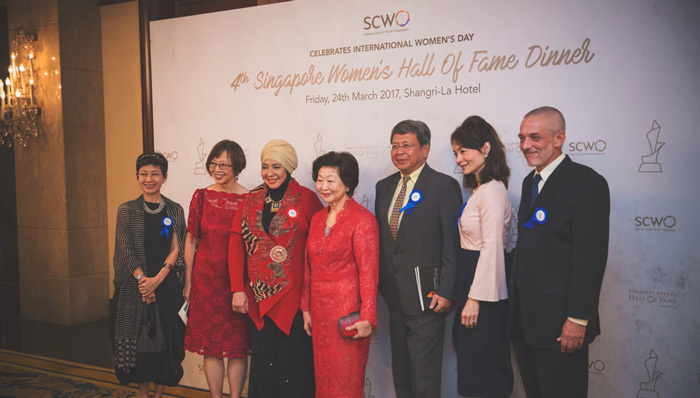 It was an honour for me to be able to be part of the team behind the 4th Singapore Women’s Hall of Fame (SWHF) induction ceremony and International Women’s Day gala dinner, held on the 24th March 2017. 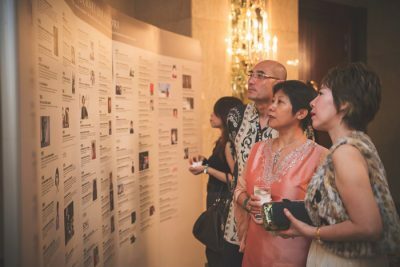 As an intern at Singapore Council of Women’s Organisation under SWHF, I saw the hard work the team put into preparing for this event and was totally awed by how it was so well put together into such a brilliant night. The ballroom was filled with immense vibrancy as guests arrived dressed in beautiful gowns and various traditional clothings. It was a special evening to once again celebrate and honour the women who had made a difference and went against odds. It was an evening filled with pride and joy, laughter, and even tears for some. I think it is especially significant for the representatives of the inductees as they watched the successes of their loved ones celebrated by all. Not only does the SWHF document these amazing stories of great women, it also hopes to inspire women from one generation to another. Sylvia Kho, a pioneering bridal gown designer and entrepreneur that started her bridal business in Singapore in 1946. Marjorie Doggett, the co-founder of Society for the Prevention of Cruelty to Animals (SPCA), who once disguised herself as a laboratory technician so she could find out how animals were being used for research in laboratories. Aisha Akbar, who was the voice a generation of schoolchildren grew used to as they listened to her radio programmes and the songs she wrote, including ‘The Satay Man’. Wong-Lee Sok Tin, who set the standards for Singapore’s broadcast journalists with her lifelong devotion to broadcasting. Theresa Chan Poh Lin, who established herself as the Helen Keller of Southeast Asia with her persistance and resilience for life after losing her hearing and sight to meningitis in her early teens. 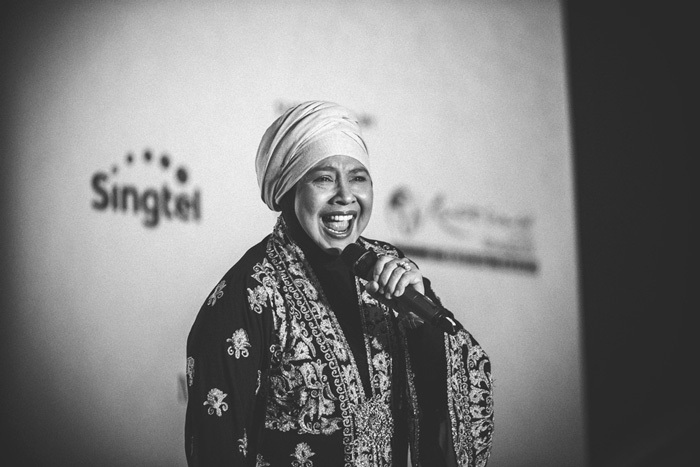 Anita Sarawak, who has been described as a singing cyclone, a consummate entertainer and Singapore’s singing ambassador. Last but definitely not least, Rahimah Rahim, also known as Singapore’s first lady of song. She was born to sing and perform and highlighted the evening with an extremely thoughtful and touching performance. Rahimah Rahim, one of the 2017 Honorees who was inducted that night,performing a jazz number. Being a millennial Singaporean, I did not know who Rahimah was, until I came across her profile at work. Yet, it was the moment she took the stage that evening that truly defined the importance of her life-long work for me in today’s society. Her charisma together with her powerful notes and friendly demeanour encapsulated not only sheer talent but also a great sense of rootedness and humility. Her presence that evening was significant not only because she was the only inductee there at the event (the rest were represented by either family or friends), but also to showcase a generation of entertainment artistes that she represented. I could only imagine how touched she must have been sitting amongst the other inductees’ representatives watching the video that SWHF had purposefully put together. Years have gone by and though she is not as active in the spotlight as she used to be, I am most certain what made her who she is now will always take an honest spot in her heart. The girls from Kids Performing™ Academy of the Arts. My role for the night was to be responsible for a group of young girls who were going to perform at the beginning of the evening. Little did I expect the group of six girls, who are between eight and eleven years old, to be so outgoing, confident and cheerful. It was a joy interacting with them. Two of them even gave me hugs and asked me for my Instagram when I was watching their rehearsal. There was absolutely no hint of nerves or stress in them. I believe they truly enjoyed what they were doing – dancing, singing and speaking. It is great to see these young girls with such zest for life and in what they do and it is extraordinary having them perform for our guests. Sure enough, the girls put up a stunning performance that was cute and inspiring all at once. It felt as if the whole ballroom was bursting with immense female pride and positivity.